Now, instead of 3 months to prepare for our trip, we only had three weeks. Fortunately, the majority of the equipment had already been acquired and organized prior to this new schedule. Our plan was to ride to Cape Spear, Newfoundland in relatively the most direct route, in the least amount of time, and as safely as possible. On the return trip we would to take more time to explore as many tourist attractions as possible. 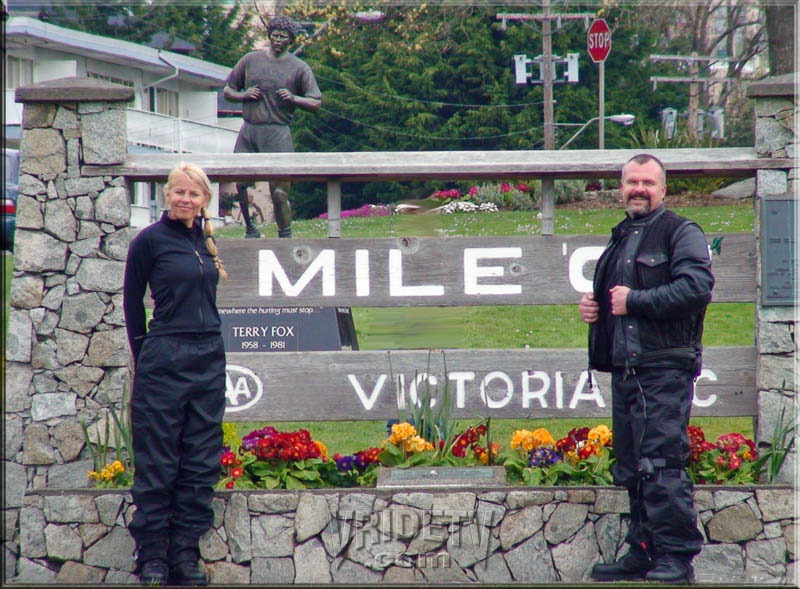 Diane and I rode to the most western point of the Trans-Canada Highway, Mile "0" at Beacon Hill Park located in Victoria, British Columbia. Returning to our home in Langley later that day. 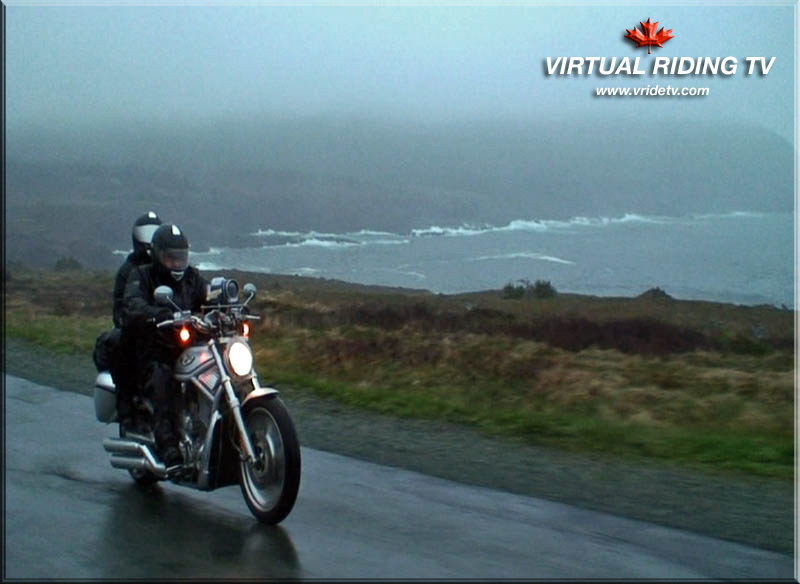 We left Grand Falls and rode to Cape Spear. We arrived at the most Eastern point in North America, Cape Spear, Newfoundland. 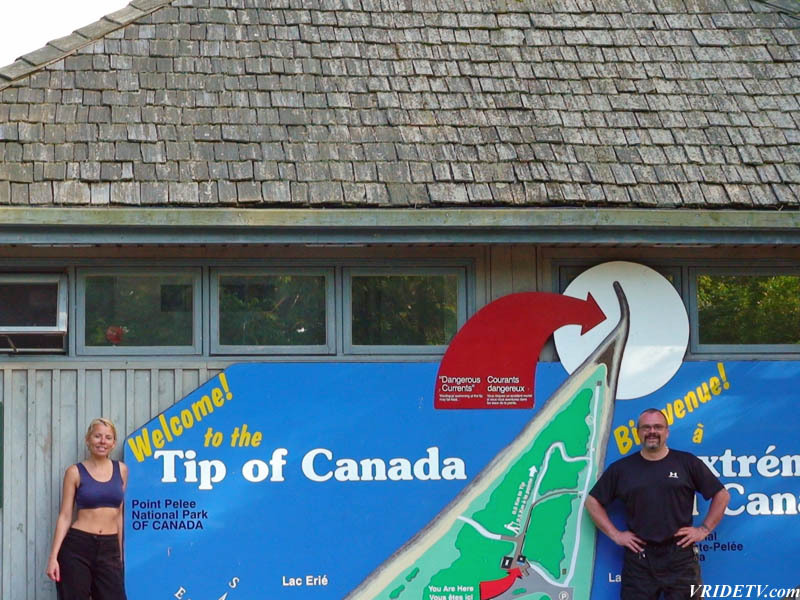 Left Niagara Falls and rode to the most Southern point in Canada, Point Pelee National Park, Ontario. We caught the last tram of the night that takes you to the "tip of Canada". 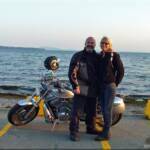 We left Point Pelee at 7:00pm and rode to Sarnia where we spent the night. 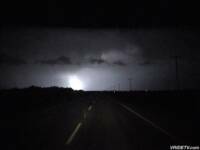 I left Carlyle with 114 kilometers to ride in the pitch black on highway #13 riding towards an impressive light show. Soon I was in the middle of a thunder and lightning storm with extremely heavy rain and at one point hail. The funny thing was, had it not been for my mistake earlier I wouldn't be in this situation. and in my opinion the crowning jewel of Canada. 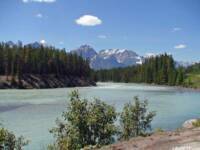 Jasper National Park, the Columbia Icefields, Banff National Park, Saskatchewan River Crossing, Lake Louise and Banff are some of the most beautiful and scenic places I have ever seen. At the end of the day I was in Radium Hot Springs and spent the night there. May 2nd: All packed up ready to go, pulled the bike out of the garage and discover a nail in the rear tire. It was short notice but I.T.C found a set of tires and they were installed courtesy of Hawgzotic Customs Cycles. 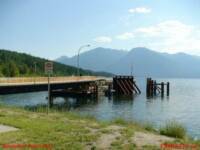 May 3rd: The trip officially begins, we left Langley, British Columbia and rode to Three Valley Gap, B.C. 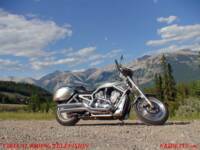 May 4th: Leave Three Valley Gap to Strathmore Alberta. May 7th: We left Weyburn and rode to Winnipeg Manitoba and stayed with more family. May 8th: Visited with family and friends in Winnipeg and Selkirk. May 10th: Winnipeg, Manitoba to Ignace, Ontario. 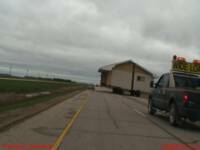 Approximately 30km East of Winnipeg we were surprised to see a house being moved on the Trans Canada Highway. May 12th: Thunder Bay (+3c with -2 wind chill) Check the Weather channel at 8:47am and there are freezing rain and ice pellet warnings for the Nippigone area. Decide to wait out the storm. Pool, hot tub, do our laundry, etc. May 16th: Ottawa to Montagmy, Quebec. May 17th: Montagmy to Edmundston, New Brunswick. 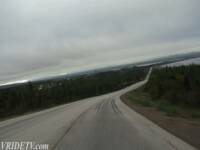 May 18th: Edmundston to Moncton, New Brunswick. 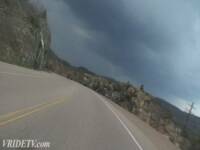 Motorcycle riding in heavy rain on the Trans Canada Highway #2, between Grand Falls and Aroostook, New Brunswick. May 19th: Moncton, New Brunswick to Sydney, Cape Breton Island. May 20th: Sydney to North Sydney and catch the 2:00pm Ferry to Port Aux Basques, Newfoundland. Normally it's a six hour crossing, it turned into a seven and a half hour "Adventure" because of a big storm with hurricane force winds. We were both extremely sea sick to say the least. On the way back to Paradise we stopped off at the fish mongers and bought lobster for supper. It was the best lobster Diane and I have ever had! We all ate until we could eat no more. 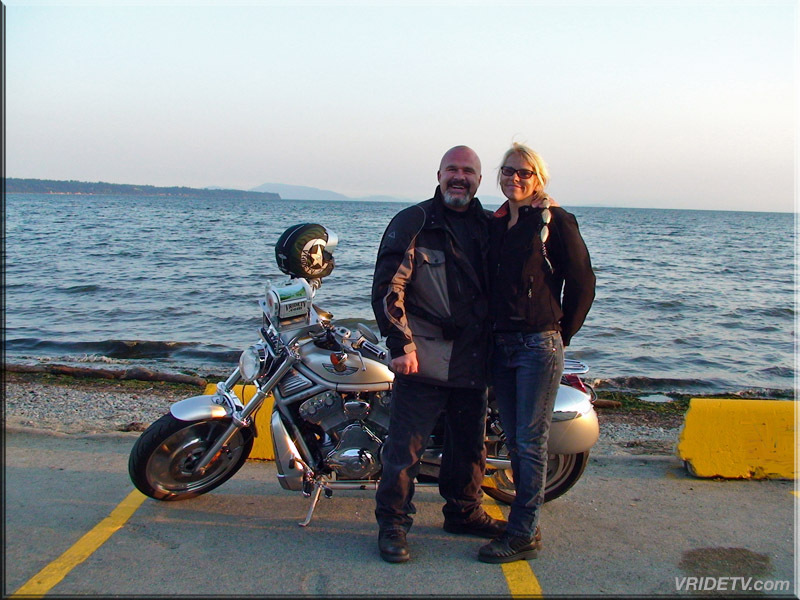 May 24th: Picked up the bike and rode to the most Eastern point of the Trans Canada Highway. Afterwards fish and chips on the beach, then back to Paradise and dropped off the bike. Our friends were taking us on a tour en route to a traditional dinner of "Fish and Brews" at another friend's house. May 25th: Friends took us on another tour to Logy Bay, Outer Cove and Middle Cove. 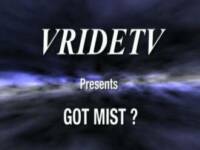 We were then taken to "the Gut" where we were "screeched in" at the "Quidi Vidi Inn of the Olde" That night back at Paradise, we were treated to another traditional supper, a "Jiggs Dinner". from the most Eastern point. Our friends followed us there and taped us as we left Cape Spear and rode through St. John's, and to the first gas stop out of town. We said our goodbyes there and thanked them for their incredible hospitality. May 27th: The Weather channel reported that heavy rain and Wind Warnings were issued for the infamous Wreakhouse area. We left Grand falls and rode to Deer Lake and called the hotel in Port Aux Basques and asked for an update on the conditions for Wreakhouse. Rain and wind warnings were still issued, said to check back later. We did from Cornerbrook and the conditions were the same and suggested to stay put and wait it out and try again in the morning. We decided to ride to Stephensville and spend the night there, the ferry we wanted to catch was leaving at 12 o'clock the following day. May 28th: Check the weather channel and the warnings had been lifted. We left Stephensville at 8:00am and headed to Port Aux Basques. (166 kilometers) We boarded the MV Lief Erickson and had better weather for our crossing this time. Spent the night in North Sydney. 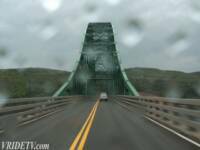 May 29th: We left North Sydney in the rain and headed towards Harris Mountain then to Englishtown where a small cable ferry shuttled us across the river to beginning of the famous Cabot trail. 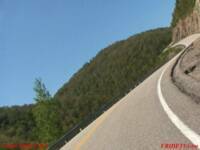 The Cabot Trail is a motorcycle enthusiasts dream, windy roads and spectular scenery. The rain stopped at Ingonish and we removed and dried it at a point of interest in Cape Breton Highlands National Park overlooking Pleasant Bay. We were there for approximately 45 minutes and the weather turned from blue sky and sunny, to grey and threatening. We packed our rain gear and tried to out run the storm that was rapidly approaching. The day ended with an beautiful sunset at Inverness, Cape Breton Island. May 30th: Left Inverness, C.B.I. with blue sky and sunshine and rode to Shad Bay,Nova Scotia. May 31st: We left Shad Bay at 9:30am and rode to Peggy's Cove, then we were off to Lunenburg for lunch. We would have liked to stay longer in both places but had to press on. From there we rode to the Confederation Bridge and arrived in Charlottetown, Prince Edward Island just before dark. June 2nd: Packed up the bike and headed to the Birth place of Confederation, Province House. 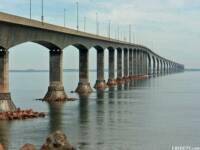 Then back over the Confederation Bridge. On the New Brunswick side there is a road that takes you under the bridge. We stopped there for picture and found ourselves in awe of the structure. We decided to go ride back over it! Now back at the P.E.I. toll booth, the lady was surprised to see us again, and enjoyed our enthusiasm over something she sees daily. 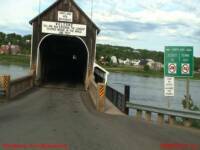 Around 6:00pm we were in Hartland New Brunswick crossing the Worlds longest covered bridge. The day ended at Grand Falls New,Brunswick. 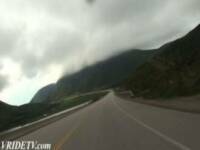 June 3rd: We left Grand Falls and headed towards the rain clouds and had to stopped under an overpass to put on our rain gear near Edmunston Shortly after we crossed into Quebec a bird hit me in the shoulder. It felt as if I was punched! We stayed in Quebec City that night. June 4th: Left the hotel all packed up and headed to Old Quebec City for a little sight seeing. We would have liked to spend more time there as there was so much to see. A very beautiful place rich in history. From there we rode to Old Montreal, did some sight seeing and had dinner at the famous Schwarts Deli. Left Montreal and rode to Ottawa. It was a full day, when we checked into our hotel around 10:00pm. June 5th: Loaded the bike up and went to the Parliament buildings. It wasn't long before we saw a horse drawn carriage tour and that prompted us to check into a hotel and spend a full day sight seeing in our nations capital. Taking the Horse drawn carriage tour is highly recommended. We saw all the Embassies, museums, art galleries and all the major tourist attractions while our guide gave us historical details of what we were seeing. Later that night we had dinner at an revolving restaurant and watched the sunset over the city. June 11th: Kenora to Winnipeg and visited family and friends. June 12th: Dropped bike off at Lonestar Harley-Davidson in Winnipeg for a new set of tires. June 13th: Caught up on some laundry and rest. Later visited with family and friends. June 14th: At 3:30 am I got up with Diane as she got ready to fly home because our friend was moving to California on the 16th.I picked up my bike Around 3:30pm and left Winnipeg at 5:00pm. It was late in the day but I had plans to go fishing with my uncle in Weyburn Saskatchewan the following day. I wasn't about to miss the chance to fish in the very same spot that I had with my Grandfather many years ago. Things were going smoothly until I left Carlyle Saskatchewan on Highway 9 instead of Highway 13. I didn't realize this for 45 kilometers. Now I had to ride back to Carlyle and try to get there before the gas station closed. I made it with about 10 minutes to spare. I had called my uncle from here an hour earlier and now I had to phone back and told him what happened. He had a good laugh and told me that a thunder and lightning storm had just started in Weyburn. June 16th: Spent the day visiting family and driving around the Weyburn area, reliving childhood memories of many summers spent there. It was here my grand-parents bought me my first minibike when I was seven. June 17th: Cleaned bike, packed and rested up. June 19th: My aunt and uncle took me on a tour of Saskatoon. June 20th: Left Saskatoon in the pouring rain and rode to Edmonton where I stayed with family. June 21st: My aunt took me on a tour of Edmonton and Fort Edmonton Historical site. June 24th: Blue skies and sunshine as I left Edmonton and rode to the Jasper Park Lodge where I had a swim and dropped off my gear. 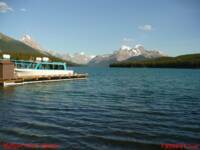 I then rode to Medicine Lake and Maligne Lake. 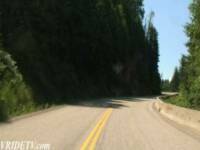 June 26th: Rode from Radium Hot Springs to Ainsworth Hot Springs, British Columbia. Our sincere thanks goes to the friends and family that opened up their homes to us where we enjoyed their company, home cooked meals and the opportunity to sleep in a home, instead of a hotel. Special thanks goes to our friend that stayed at our house and took care of our dog and two cats. It was a great piece of mind knowing you were there and taking care of "our kids".